We are proud to offer some of the best prices in the UK on NCR printing; being a product that we specialise in we can offer some competitive prices on both short and long runs. We offer Pads, Books, Loose Sets and Continuous NCR Forms. Gone are the days of using messy blue carbon paper, NCR paper which stands for No Carbon Required allows you to duplicate, triplicate and quadruplicate what you are writing in a clean and easy way. Everything we print is personalised to your exact requirements, allowing you to display whatever you wish at no extra cost, such as your company logo, contact details, a form/table and anything else you may require. We offer 2 part, 3 part and 4 part options, our standard colourway is white (top copy), yellow (2nd part), pink (3rd part) and green (4th part) although we can collate in a different order and offer other paper colours on request. We also offer many optional extras such as sequential numbering, perforation, drilled holes, wrap around writing shields and front covers. Prices for NCR printing shown on the website are for pads printed in a single colour, however, we also offer books, loose sets, continuous NCR forms and printing in 2 colour, 3 colour and full colour on request. NCR’s have a number of uses with invoices and receipts being by far the most popular. 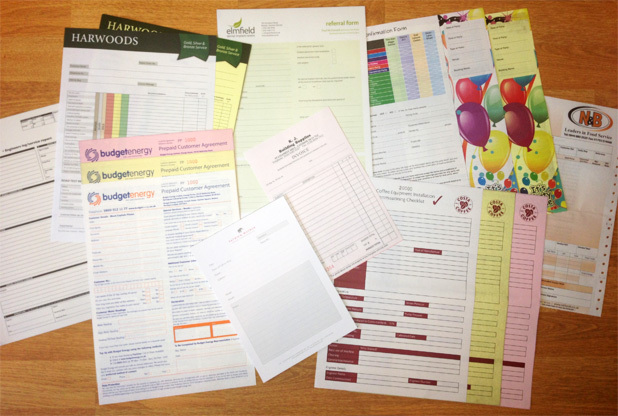 If you have any questions about our NCR printing services then do not hesitate to get in touch.